Email is of course a great way to share images and you can share images via email directly from Lightroom. Sending images via email from Lightroom is actually quite simple - usually. It is an "Export" process. So all you have to do to start the process is Right-Click (or ctrl(pc)/cmd(mac) + click) on the image you want to email and select Export > For Email. 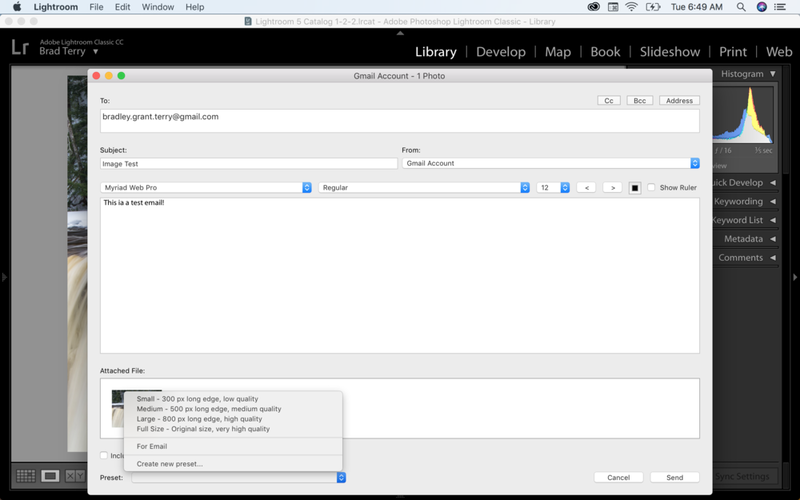 This will bring up a dialog box (as seen below) that has the options for your email. Starting at the top you insert the email address that you want your email to be sent to - you can start an Address Book by clicking the Address button in the upper right. If you plan to send to multiple addresses at once I suggest adding email addresses and names to the Address Book first as this will save you time in the future - for some reason Lightroom has an issue sending to multiple email addresses if they aren't in the address book and I honestly don't know if this is intentional or a bug. And below the "To:" box you have your "Subject" and to the right of that you have your "From" box. And this is where it can get a little tricky. When you click the double arrow next to the "From:" box you should - hopefully- see your email provider - Gmail for example. Then you want to select your provider and navigate to "Authentication Method" and make sure "Password" is selected. Then, below that, enter your email and password and click "Validate". You should be good to go! Now, depending on your security settings from your email provider this may or may not work. You may get an error message when attempting to send. If you do head to your email and navigate to the security settings. 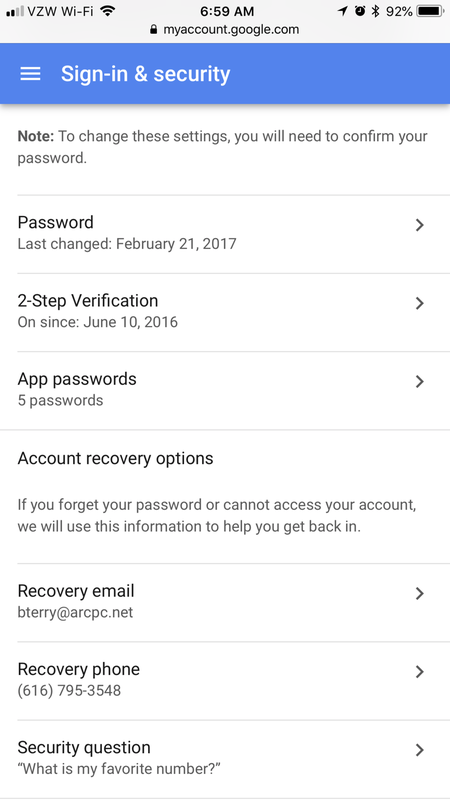 Below is an example of the security settings on Gmail from their mobile site. 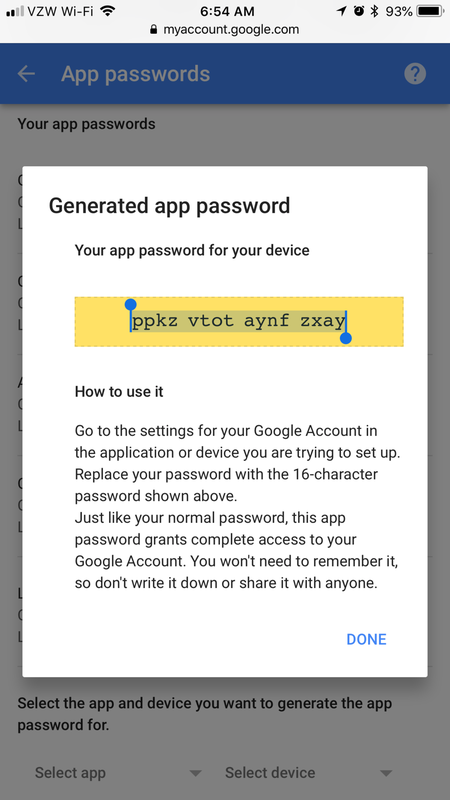 In the Gmail example, head to the "App Passwords" section and select "Other". I typed in "Lightroom" when asked for a name for the App and told it to generate a password. 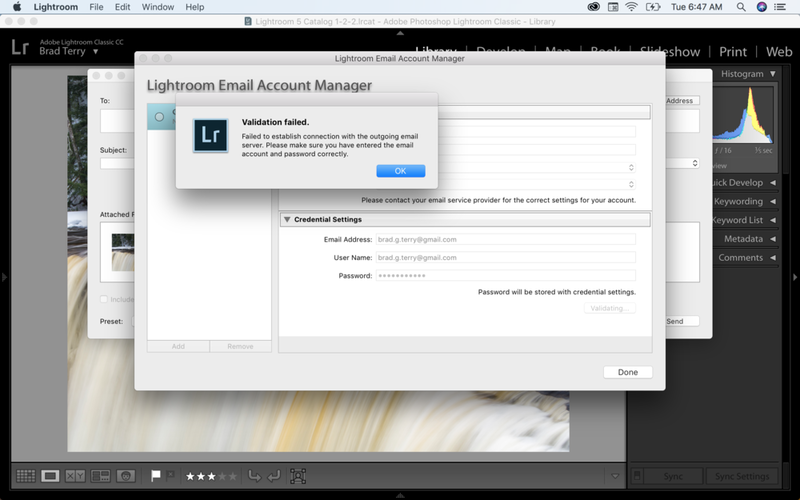 Then copy and paste that password into the password section in the email dialog box in Lightroom. After that you should be up and running and ready to send an email! Now since this is an Export Process that means that you can use an Export Preset when you want to send an image via email. If you recall we covered creating an Export Preset in a vide tutorial that you can find here. If you do decide to create and use an Export Preset for sending your images via email then when you right-click on image you would select Export then the preset you created, not Export For Email. And there ya go! That's how you email images directly from Lightroom. Give it a try and see how easy it can be to share your photos with email! As always, if you have any questions let me know or post in the Facebook Group!